Art Basel season is almost here, and FIU’s Patricia & Phillip Frost Art Museum has a lineup that will draw the international art community to campus. Art Basel is an art festival that brings artists and art lovers from around the world to Miami – more than 70,000 people attend each year – providing a platform for local museums to share their exhibitions and collections with the international audience. 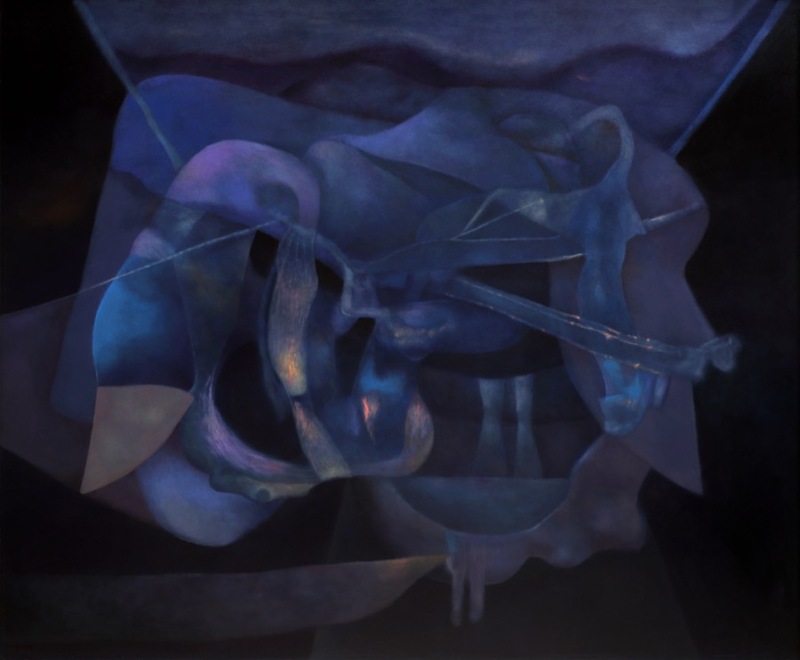 This season, the Frost Art Museum will celebrate Latin American and U.S. Hispanic culture with three exhibitions: Rafael Soriano: The Artist and Mystic; Reflection of the Americas: New Acquisitions from the Collection of Univision; and Continental Abstraction: Highlights from the Art Museum of the Americas. All provide explorations of art across cultures. Hortensia Soriano, daughter of Rafael Soriano. Rafael Soriano: The Artist as Mystic is a celebration of coming home and a family reunion. The exhibition is an unprecedented retrospective of Cuban-born Rafael Soriano, an acclaimed master of geometric abstraction and a global figure in the twentieth-century art world. It features more than 90 paintings, drawings and pastels. Hortensia Soriano, the daughter of the artist who passed away in 2015, recalls the importance of the paintings in the household. Special thought was put into the naming of each piece, a task her father tackled with her mother, Milagros Soriano. Milagros was the carpenter; she made his frames and mounted his canvases. “I helped my mom. My dad and mom were a team. He could have never painted all of this without her,” Hortensia says. Rafael Soriano. Serena imagen, 1991, oil on canvas. Private collection. Rafael was a nocturnal painter, playing different genres of music during his nighttime sessions. “I could hear the music from my bedroom window. I knew my father was at his happiest because he was painting,” Hortensia says. The exhibition immerses the visitor in who Soriano was as a painter and person. His brushes, canvas and easel are on display allowing visitors to imagine the artist at work. His professor college ID from Matanzas, Cuba, news clippings and pictures are also on view in glass cases. Among the pictures is a photo of Rafael and Hortensia in Cuba in 1979. Arranged chronologically, his works sit on lilac-colored walls. His early paintings embody the popular style of geometric abstraction and vivid earth tone colors. Straight angles and a wide range of shapes distinctively can be seen within each piece. Rafael’s transformative phase took place midlife, a noticeable shift. The geometrics and structured sense of the pieces become softer. After being exiled, Rafael left behind geometric abstraction. He painted the human experience, emotions of joy, love and suffering thus ushering in his mature period. The work from this period illustrates mystical introspections and abstract expressions. His later works are masked with navy blue and gray, and complemented with his skill of luminosity, the subtle presence of light or glow in the midst of the painting. “It’s an internal light that manifests in his paintings. The light draws us in,” Hortensia says of her father’s work. The colors he used resembled the colors he remembers from Matanzas Bay, Cuba, where he lived. Hortensia’s favorite piece by her father is Anguish of Oblivion, a painting he created in 1996 after he was diagnosed with dementia. “It is that painting where you know exactly how he was feeling,” she says. Hortensia is happy that her father’s art can impact and resonate with the Miami community. “Miami has been our home for us since 1962, and this is his backyard. To be able to celebrate with his community, which he loved, helped and supported him for all these years is extremely gratifying,” she says. The story of Rafael is one of transcendence and peace. He stopped painting in 2000. “I would ask if he ever missed painting, he would say to me ‘Everything I was going to paint, I already painted.’ He was satisfied with his work and life,” she says. 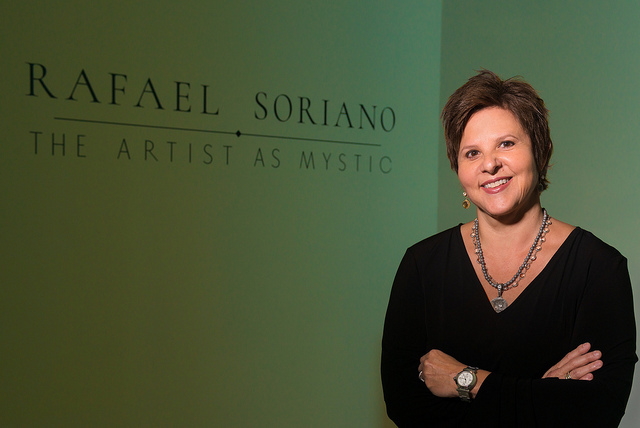 Rafael Soriano: The Artist as Mystic will be on view through Jan. 28. 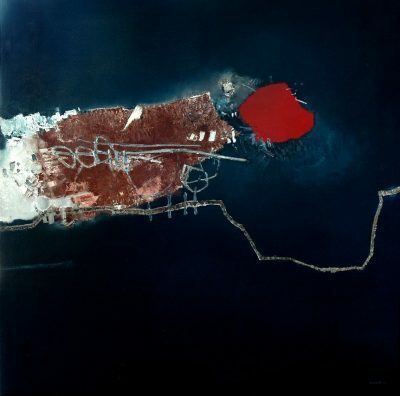 Manabu Mabe, Agonia (agony)[detail], 1963, oil on canvas. Collection of OAS AMA/Art Museum of the Americas. The second exhibition, Continental Abstraction, includes more than 40 works from 30 artists. The exhibition highlights social, cultural and artistic concerns of Latin America. It depicts themes of poverty, exile, migration, freedom and creativity. Visitors are greeted with a display of blue and green sandals laced with barbed wire. The attention-drawing layout is bound to captivate the audience and tell the story of suffering. The exhibition is an exploration of mid-century abstraction throughout Latin America. A few of the artists featured challenge the surface or experiment with materials and form. Some offer an optical illusion, similar to a hypnotic spiral. The three-dimensional works speak for themselves: a geometric sculpture that resembles a Rubik’s Cube and a mounted lit orb. “Continental Abstraction is a beautiful exhibition that will expose visitors to new ideas, concepts and content. They are all tremendous works,” says Pomeroy. Continental Abstraction – organized in Miami by the Frost’s curator Klaudio Rodriguez and Maryanna Ramirez, manager of Strategic Initiatives – will be on view until Feb. 18. The artworks in the exhibition Reflections of the Americas is a donation from the collection of Univision Communications and is now part of the Frost’s permanent collection. 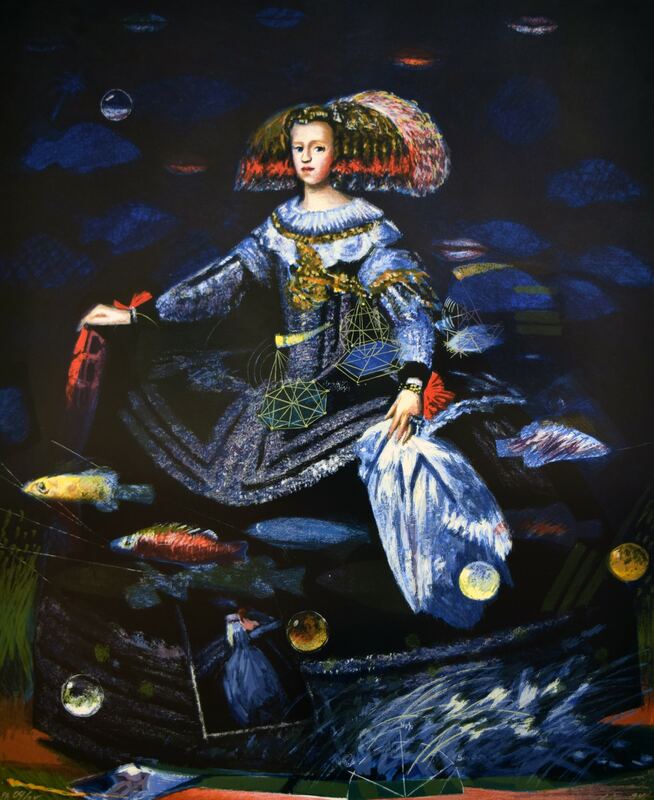 The works of 40 artists across Latin America and the United States range from the 1990s to the 2000s, including paintings, mixed media and serigraphs. The exhibition offers political and social themes. There is a wide span of art styles and diverse collections that add dimension. Some pieces depict landscapes and household objects. A painting of farmers harvesting corn in the field, glazed with yellow and copper colors is just one stunning piece that can be found among the many works. Reflection of the Americas: New Acquisitions from the Collection of Univision will be on view through Jan. 3.